JOHN Bateman said interest from other clubs never threatened his decision to extend his stay at the DW Stadium. The tireless and robust 22-year-old was out of contract at the end of next season, but has impressed so much in a season which saw him pick up the club’s Player of the year award and Players’ player of the year award, he has sealed an extension. And despite other clubs circling the former Bradford star, Bateman revealed leaving was never on his agenda. “There was interest from other places and Australia but I want to stay here,” he told the Evening Post. Bateman’s new contract will see him remain at the DW for the next four seasons – unless he wants to test himself in the NRL in 2019 and a ‘substantial transfer fee’ is agreed. But he says a move Down Under is not a guarantee. “It’s one of those things, if it ever pops up there’s the chance to do it,” he explained. “I’m not guaranteed to ever do it – I might want to stay at Wigan all my life. 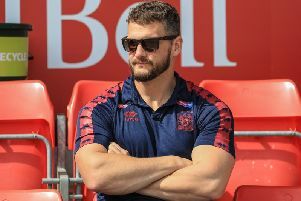 Bateman – a former England academy captain – was speaking at St George’s Park, the FA’s state-of-the-art training base used by the national rugby league squad for their autumn internationals. He is among a six-strong Wigan contingent with the England squad as they prepare for Saturday’s match against France at Leigh Sports Village. The match acts as a warm-up for the forthcoming Test series against New Zealand and Bateman says England have to take their chance. “You look around the squad but the squad we have, player for player is one of the best in the world,” he said. Coach Steve McNamara will name his provisional squad today and is waiting to see if Sam Tomkins and Sean O’Loughlin recover from injuries in time.